In this tapestry, we see the entire panorama of the idyllic countryside in which the "Noble Pastorale" a series of 6 tapestries by French artist Francois Boucher, is set. Here we see the village including the manor, the fountains, the flowing river, the abundance of flowers and plants which decorate the countryside. The works of Boucher often contains nobility or villagers in their daily lives in idyllic landscapes. 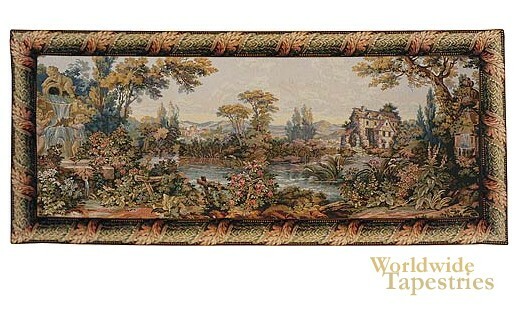 This Francois Boucher tapestry "Mill by the Lake" is backed with lining and a tunnel for easy hanging. Dimensions: W 78" x H 38"
Dimensions: W 88" x H 48"